10/27/2011 – MAITLAND, Fla. (Sept. 23, 2011) – Tony DiMare, vice president of DiMare Company and a veteran in the tomato industry, was awarded FFVA’s Distinguished Service Award during FFVA’s 68th annual convention. DiMare has worked in his family’s company since 1983 and now oversees its operations in Ruskin and Homestead, Fla., and Johns Island, S.C. He has served as a volunteer leader in numerous state and national organizations. A member of FFVA’s board of directors since 1996, DiMare served on the executive committee from 1996 to 2008 and as chairman from 2004 to 2006. He took on the chairmanship during on the heels of the 2004 hurricanes, which had a significant effect on Florida’s specialty crop industry. DiMare also has served as president/chairman of the Florida Tomato Exchange, the Florida Tomato Committee and the Florida Tomato Growers Exchange. At the national level, he was elected in 2008 to serve on the United Fresh Produce Association’s board of directors. In 2002, he was appointed by the Secretary of Agriculture to the first USDA Fruit and Vegetable Industry Advisory Committee. Also that year, he served on the Florida Agriculture Trade Advisory Committee for then-Congressman Adam Putnam. 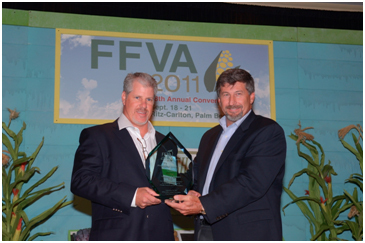 The award presentation took place during FFVA’s 68th Annual Convention at The Ritz-Carlton in Palm Beach. Florida Fruit & Vegetable Association is an agricultural trade organization representing Florida’s producers of fruits, vegetables and other crops.